I lift my head from my book. Kevin is standing in the middle of our backyard talking to Galen. She is several yards away on a small island of black mulch that circles a tree near where our yard ends and our neighbor’s begins. Galen’s purple ball – it looks like an oversized kettle bell – rests on the ground in front of her. She picks it up by its handle, shakes it furiously, and then returns it to the earth. “Bring the ball,” Kevin says for the third, maybe fourth, time. I watch the scene unfold from our deck – my husband and my dog are infinitely more interesting than the story I am reading. Galen stands her ground. At this, Kevin turns and walks toward the back of our property, which stretches for two acres. Galen darts after him. Interestingly, Galen isn’t our first dog to refuse to play fetch the way the game was intended. Gryffin, too, established his own rules, which called for a stick in addition to a ball. In Gryffin’s version: Human throws stick. Dog retrieves it and waits for human to throw ball. Then, with stick in mouth, dog chases and then pounces on ball. Human walks to dog, grabs stick, then ball. In neither Galen’s nor Gryffin’s fetch does the dog return the ball to the human. I often wonder how it is that Kevin and I raised two dogs who can’t play a traditional game of fetch. Sometimes I like to think it’s that we raised our dogs much like we are bringing up our daughters – to be creative, independent thinkers for whom we provide the parameters within which they are permitted a large percentage of freedom. Other times, I concede that our dogs trained us better than we trained them. 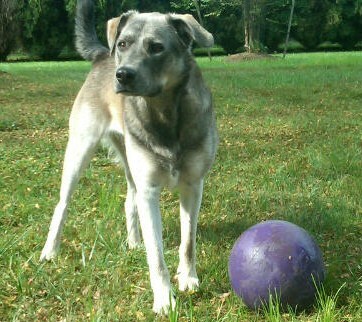 Back from their walk, Galen grabs her purple ball by the handle and runs to Kevin. He pets her, heaps praise upon her. This is how the game is played, he tells her. Then he hurls the ball across the yard. Galen retrieves it and runs… back to the mulch. She shakes the ball and looks at Kevin expectantly. This time it is Kevin who stands his ground. I smile inwardly. It will only be a few seconds before Kevin walks toward Galen. You see, she is the more stubborn of the two. And she’s no dummy. She knows she’s trained him well. Galen and her favorite fetch-worthy ball. This entry was posted in fetch, Galen, Gryffin, musings. Bookmark the permalink. I know exactly what you are saying. We played the same game, and she doesn’t even have me trained! She may not have you trained, but she did get you to play fetch her way. Kevin often questions Galen’s intellectual acumen, but I think she’s smarter than he gives her credit for being. Time and again, the girl gets her way!